The Abyssinian guinea pig is an adorable breed which is beloved by many throughout the world. They vary in colour and have a very distinctive coat texture and hair growth which makes it stand out compared to other guinea pig breeds. In order to get to know them better, here are some facts to introduce you to them. When being prepared for shows, it does not need as much preparation as other types of guinea pig’s. What distinguishes them is the texture of their coat which is rough and harsh. It has a short,rough coat that has a total of eight rosettes on its shoulders, sides, back and behind. 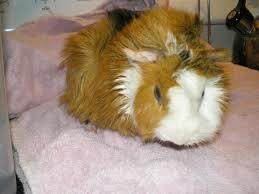 They are typically much likely to have more lively personalities than other breeds of guinea pig. They tend to be quite energetic guinea pigs. Abbys are a lot more likely to be troublemakers than the smooth haired pigs. They have a reputation amongst their owners for having cheeky and mischievous personalities. No one really knows what they called Abyssinian guinea pigs as they do not come from Abyssinian, which is the former name for Ethiopia. They are known for being attentive to keeping themselves clean in order to preserve their coat. Here’s some more detail about them. The great thing about Abyssinian’s is that they are easy to groom and can be brushed regularly using a soft brush. The coat does require brushing regularly and also attention to ensure that fungal infections do not happen. They do a great job at keeping themselves clean and do not need to bathed regularly. They can be fed with a good balanced guinea pig diet of fresh water, hay and vitamin c pellets topped up with a good diet of veggies. Compared to other breeds of cavy, they prefer not to be handled as much, however that does not mean they don’t like attention and to be fussed over. Regular time with your Abby is essential for building a close bond and good trust between guinea pig and owner. They love to spend time with other guinea pigs and humans and are very comfortable surrounded by activity. If you have young Abyssinians then they should be exposed to a social environment. They tend to be more active at night when in the wild, but like other breeds of cavy sleep in short bursts of a few minutes at a time so as to keep alert. In fact they often sleep with their eyes open so as to be aware of any potential danger. They are vocal animals and love to chat away especially if given the attention they need or surrounded by other guinea pigs. Fore this section I am indebted to the Abyssinian cavy club has some very good guidance on the colours of the Abyssinian. Brindles have red and black hairs that are well mixed. They are separated into two groups dark brindles and light brindles depending on their shade of hair. Tortoiseshells tend to have patches of red and black hair with no set pattern. Tortoiseshell and whites have patches of red, black and white hair in not set order. Roans have a mix of white and coloured hair. There are also Blue roans who have a mix of black and white hair and Strawberry roans that have a mix of red and white hair. Selfs are those that only have one solid colour which is usually black or red but can be other colours as well. Any other colours are those that don’t fit into the above categories. Abby’s are very popular for showing amongst breeders because they are challenging cavy’s and have a very clear and defined showing standard for breeders to work to. Due to a lack of space I’ve had to put my guinea pig’s cage quite close (about a metres distance) to my TV. I was wondering if it would be severely affected by the light/sound coming from the TV? Thanks, and the “brief guide” was very helpful. Hola por favor colocar mas fotografías de abisinios. Uhhh, I know this will sound weird, but my Abbyssinian, Nestlé, thinks that he is a bird. Hey, I have a young Abby , and he is very shy. I have a Peruvian too, and he is very friendly and older. I’ve done everything I did with the Peruvian Caby to be friendly , but it doesn’t work .